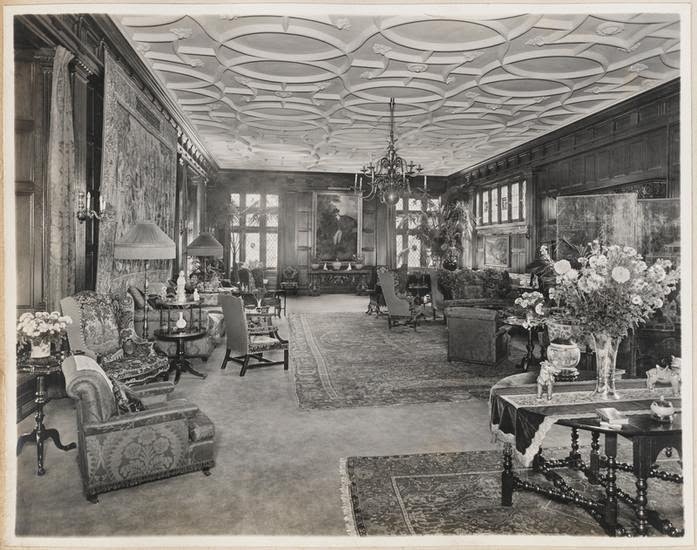 Some interiors of 'Loewmoor', the William Goadby Loew estate originally built for Charles Albert Stevens c. 1896 in Old Westbury. 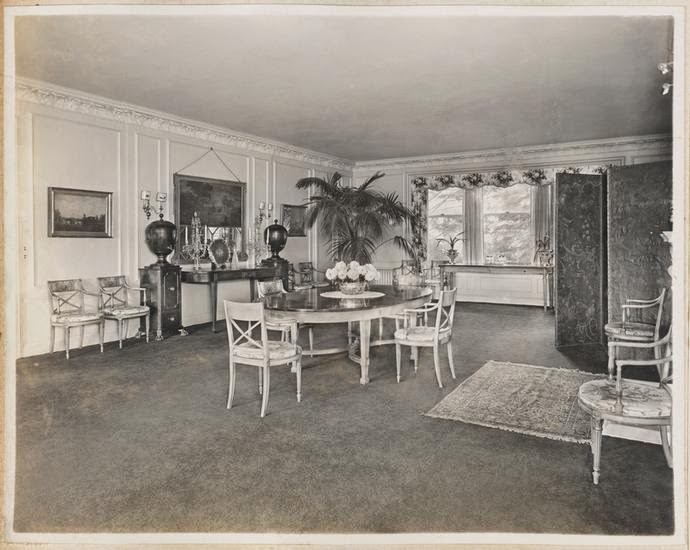 Loew would hire Walker & Gillette in 1934 to design alterations to the house which is no longer extant. Click HERE for more on 'Loewmoor'. Decorating was so weird back then. All those chairs and side tables spread throughout the rooms, angled away from walls or pushed up against another piece of furniture. Interesting to note that wall to wall (or "fitted") carpets seem to have been used in all the principal rooms,with Oriental carpets spread over them. 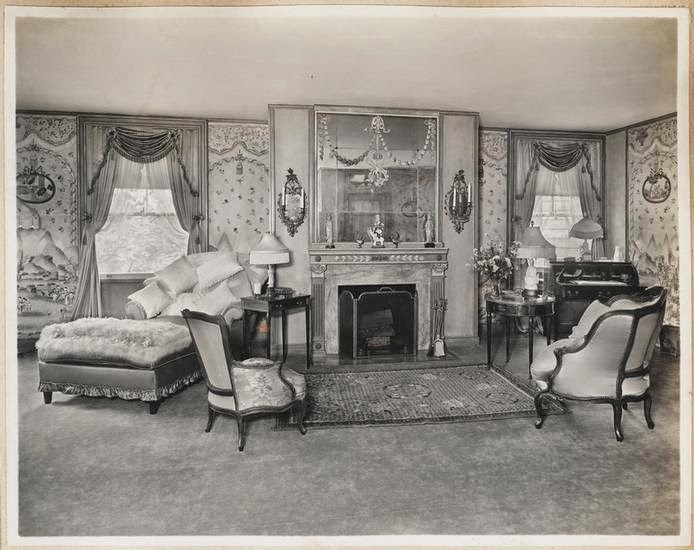 And I fully concur with Anon's comment above: Furniture placement in this era didn't seem to have much to do with actual comfort or convenience. Before I read these comments I was already thinking of a decorating term previously used by Magnus: WASP (definition: attractive, but safe). 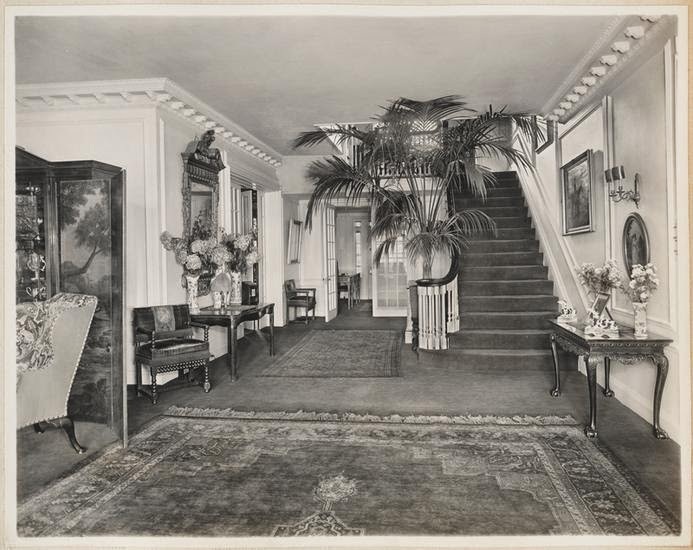 That enormous potted palm by the stairs, which by my calculation might sometimes whack you in the face, is about as daring as this interior got. Unlike the 19th C. by this time photographers had picked up on staging photos and I presume some staging is evident here as it is today. All the angled chairs and tables provide a more dynamic arrangement than a typical placement that would have aided conversation. The link brings us to "Annadale"...is that a mistake, or did this replace that estate? If I may, I wouldn't refer to this as WASP decor. The Loews were not old New York. Like so many older and new families they were mimicking British gentry, even as families with new British industrial fortunes or fortunes made in Indian tea trade for example were building large homes to emulate the Aristocracy or Gentry. Older families actually had older family heirlooms. Houses such as this were quite often furnished top to bottom at decorating firms such as W&J Sloane. 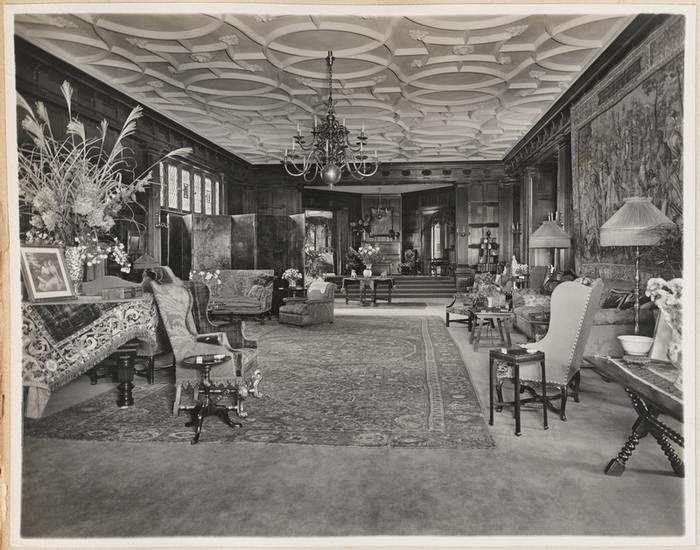 As for the angles of the furniture, this was generally staged for the photographs more than for full time position. I came across this piece of trivia several years ago. 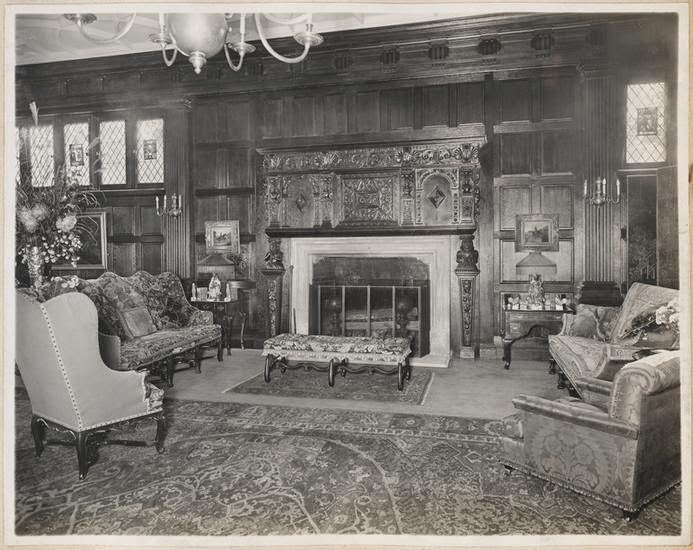 After Stevens, the estate was owned by Charles Tracy Barney whose daughter Katharine married Courtland Dixon Barnes, Sr. and resided at "Nonesuch House" in Manhasset. Their son Charles Tracy Barnes (aka Tracy Barnes) assisted Allen Dulles in acquiring the "Ciano Diaries." Barnes later became a senior member of the CIA but was fired for his role in helping Richard Bissell organize the Bay of Pigs operation. 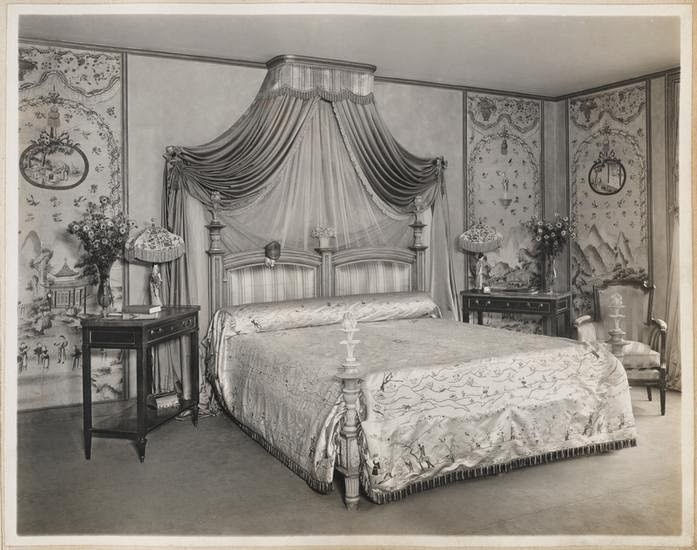 For those interested in this subject manner, several articles on Long Island socialite spies can be found at the Gold Coast Era section of our website (spinzialongislandestates.com). I guess staging was left up to the amateurs because I don't see a silk orchid or karate chopped pillow anywhere. Worth mentioning also, I suppose, that Courtlandt Barnes was a partner in the brokerage firm founded by WG Loew's namesake uncle, William Goadby. 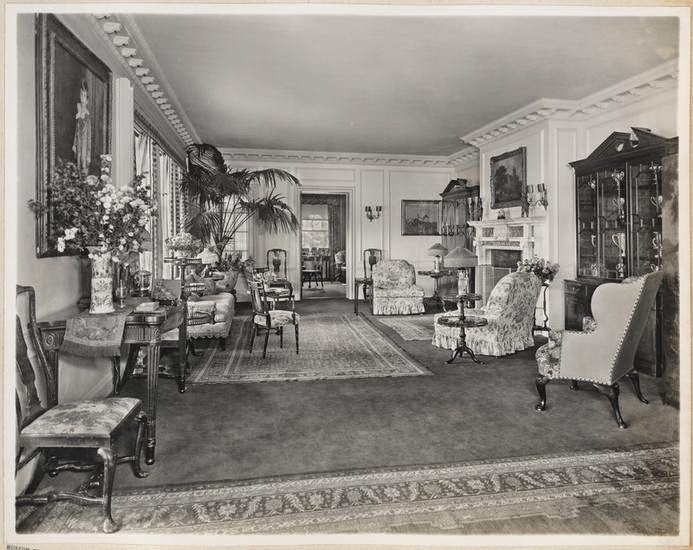 Although the Loews may not have been old New York, they certainly wasted no time making money and marrying up, and by the end of the 19th century were well integrated into the highest social circles, authentic antiques or not. And what is it with that palm tree in the stair well?